Victoria, Mahe (Seychelles) — January 22, 2018 (travelindex.com) — We speaks of Assumption Island of the Seychelles and the need to keep Military Bases out of the region. It also addresses the importance of Assumption Island for the UNESCO World Heritage Site of Aldabra. Quote of the week is seeking a refocus:- Winners focus on winning and the losers focus on winners. Seychelles is considered to be a leader in the world of tourism, bolstering the pillar of its economy through the active promotion of an environmentally friendly and sustainable tourism policy. Today, thousands of Seychellois depend on tourism for their livelihood, either as investors or as employees in the industry. Seychelles has been working hard to protect its islands. Its Aldabra Atoll is a UNESCO World Heritage Site. As a Nation, we are fiercely proud of our beautiful islands. In 1965, when the British Government formed the British Indian Ocean Territory (BIOT) by detaching the islands of Farquhar, Aldabra and Desroches from Seychelles, and the Chagos Group from Mauritius, Seychellois took to the streets to demand the return of their islands and objected firmly to any military base being established in the Indian Ocean. Following our Independence in 1976, the three estranged islands were returned to Seychelles. Today, it would appear that history is repeating itself. Seychellois are up in arms once again following the news that the island of Assumption may become a military base for India. 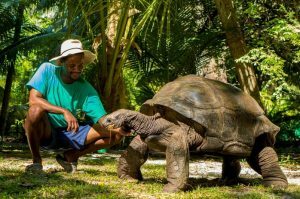 At present, Assumption Island is the base camp for the UNESCO World Heritage Site of Aldabra; without accessibility to Assumption’s airport, protection and conservation efforts on Aldabra may be hindered. The unconfirmed plans for Assumption Island beg the question: are we making the most of our valuable and precious natural resource? With Seychelles in dire need of capitalization on its outer islands to boost its tourism, and with most Seychellois never being afforded the opportunity to visit an outer island, would it not be a reasonable and more viable alternative to erect a small tourism establishment on Assumption Island for the benefit of all, as well as maintaining its present role as the Aldabra Atoll base camp? A couple of years ago, a carrying capacity study for the Tourism Industry was conducted and it became clear that, with its 115 islands, the archipelago of the Seychelles would need to look at further tourism growth by making use of, and developing, some of its outer islands. It is today important for each and every Seychellois to be consulted on this subject and a referendum is today needed.